To address these challenges in an unattended environment, the company required machine technologies that were reliable and accurate and that would meet time-sensitive delivery requirements. Already having 10 years of experience running Makino milling and EDM equipment, MGS purchased two Makino V33i vertical machining centers to enhance its automated machining, improve workflow and add new capabilities. 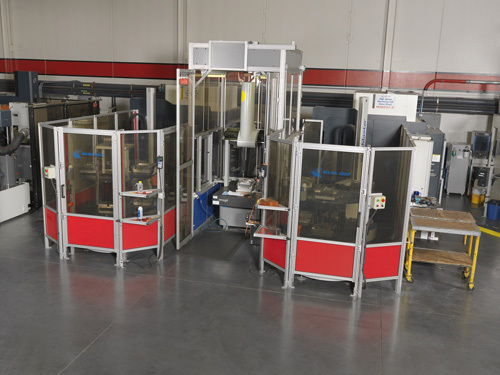 The equipment was integrated within two robotic work cells with a CMM machine. The company’s goal is to maximize spindle time while completing additional hard-milling workload with their existing personnel, especially because of their familiarity with the V33i’s control system. This would allow the company to combine its graphite and hard-milling operators. The V33i machines have extended the hard-milling capabilities at MGS. The company has been pleased that this equipment is the easiest to maintain on its shop floor, and it has brought an accurate, repeatable and cost-effective solution to its operation. Operators are confident in the performance of the machines, and, in order to maintain workflow for its tight deadlines, it often runs lights out—sometimes averaging 20 hours a day of production. EDM has been reduced or eliminated due to the accuracy of the machine, which can sometimes be as precise as 0.0001 inches. Lead-times that were once extended due to manual polishing have now been shortened because this step is no longer required. Moving forward, the company hopes to continue to eliminate EDM time and to extend its hard-milling automation investments into areas like micromachining.